We were out for dinner last night and took a yummy Pumpkin Cheesecake for dessert. I have made pumpkin cheesecake before, but wanted to try a new recipe. I found this recipe on-line. It was rated 5 stars and had 898 reviews/ratings, so I thought it was a pretty safe bet and it certainly did not disappoint. It was quick and easy to make, and I will definitely make it again. I used Paula Deen’s recipe, but made a variation of the crust using gingersnap cookies and added whipping cream and a homemade caramel sauce. I used a crust recipe from the browneyedbaker. Preheat the oven to 350 degrees F. Double-wrap the bottom and outside of a 9-inch springform pan with heavy-duty foil. Use a food processor or blender to grind the cookies into crumbs (reserve 2 to 4 cookies for “plating” the dessert). Mix together the crust ingredients and press into the bottom of the springform pan. Bake for 5 minutes, or until lightly browned. Remove from oven and cool completely. Beat cream cheese until smooth. Add pumpkin puree, eggs, egg yolk, sour cream, sugar and the spices. Beat. Add flour and vanilla. Beat together until well combined and smooth. *I left my pumpkin cheesecake in the fridge over night. The next day, I covered the top with whipping cream (about 1 cup in liquid form) and garnished it with a few reserved gingersnap crumbs and some nutmeg. I used Ree Drummond’s homemade Caramel Sauce to drizzle on top ~ so delicious! Break remaining cookies in quarters and stick in the top of each slice and drizzle caramel sauce on top. This recipe is very rich and delicious. Start with a small piece and have a second if you dare! 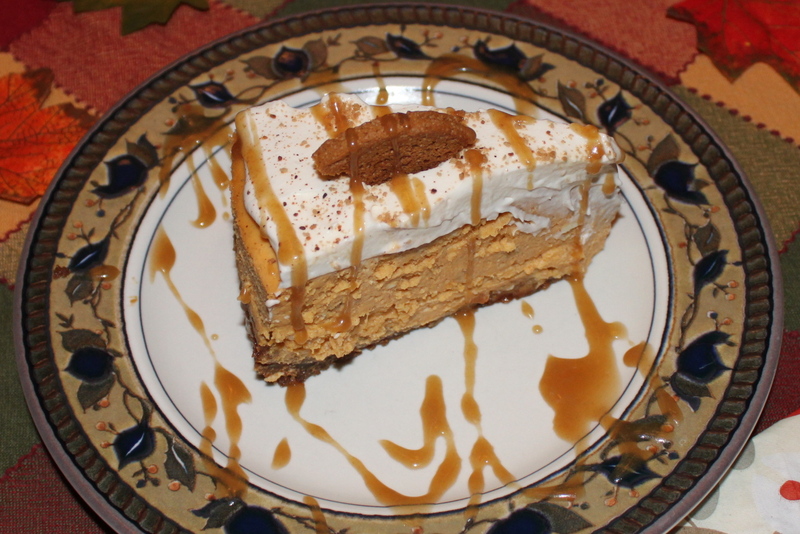 Posted on October 13, 2013 by Cindy Roy •	This entry was posted in Cakes and Desserts, Recipes and tagged pumpkin cheesecake, pumpkin cheesecake with caramel sauce, pumpkin cheesecake with gingersnap crust, thanksgiving desserts. Bookmark the permalink.